Please note that because of an unsecure nature of emails, HIPAA privacy guideline does not allow us to respond to any email of a personal nature. For any personal matters, please contact our office directly at (425) 899-5030 or via fax (425) 899-5032.
to your first appointment. Thank you. Turn right on NE 124th St.
Go up the gentle hill. Go past the Evergreen Hospital. If, for any reason, you cannot keep your scheduled appointment, or you are running late, please call us as soon as possible. We request 24 hours notice for cancelled appointments. Please note that co-pays are due at time of service. We accept cash, check, visa or MasterCard. 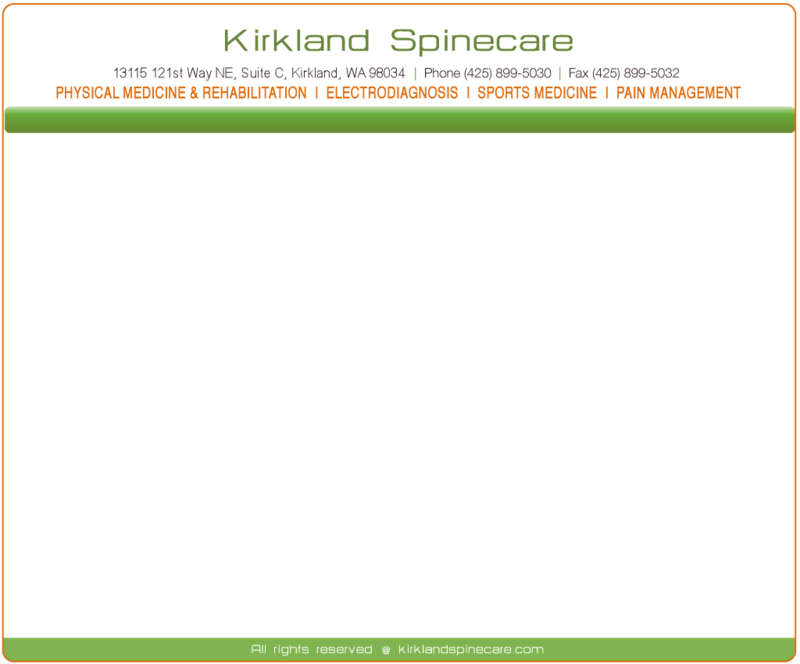 Kirkland Spinecare is contracted with most major insurance companies. To find out if your insurance is contracted with Kirkland Spinecare, please call us at (425) 899-5030. For faster service, please have your insurance card ready when calling, thank you.